Reduces Strain and Fatigue - The design of the G2 allows the user to sit or lie in the most relaxed position when reading a book. This eliminates hunching and will reduce strain in the back, neck, shoulders, and arms. Increases Overall Comfort - The versatile movements of the LEVO G2 Book Holder allow users to avoid any awkward positions, maximizing comfort. Effortless Storability - The LEVO G2 arm is easily stored out of the way when changing activities, but can quickly be returned to the original position since the book platform height and orientation are not impacted by the lateral arm movement. 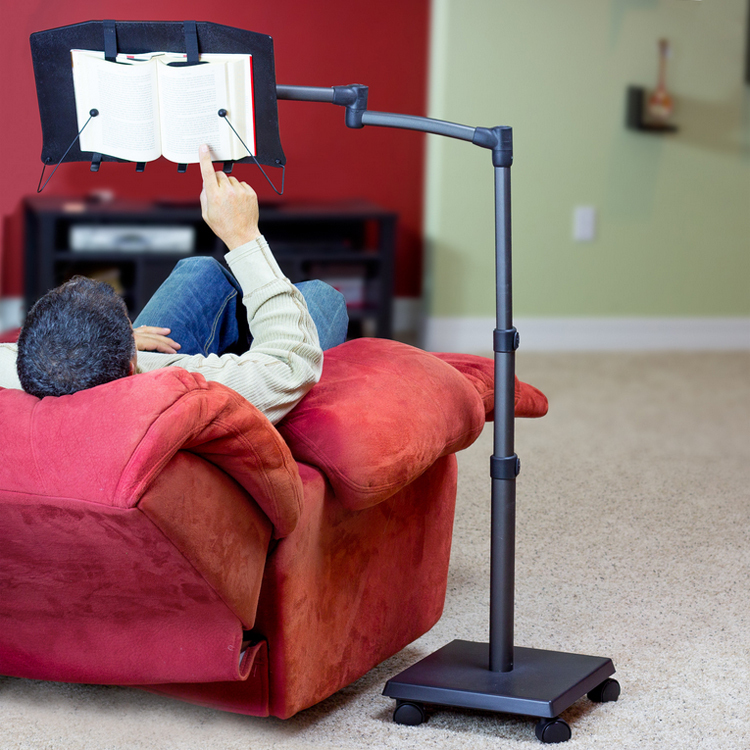 5 Axis Articulating Swing Arm: This allows the user to position their reading materials in the most comfortable, ergonomic reading position. 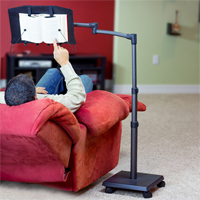 This reduces awkward positions, tired arms, and neck pain while reading. Compatible With Most Printed Materials: Supports magazines, textbooks, paperbacks and hardcovers up to 4 pounds. 360° Book Platform Rotation: The book platform rotates to any angle (support flanges are only along the lower edge of the book platform). No Clearance Required: The cantilever design of the arm does not require any clearance under furniture. However, where there is more than 4" of clearance the base can be rolled below other furniture to further extend the reach. Safe and Secure: Books strap firmly to the book platform, and are secure enough to be positioned even face-down. Precision Adjustment: Pivot point at the base of the book platform allows the reader to choose their ideal reading angle. Can Be Used Lying Down: The Levo is able to hold books even in an inverted face-down position which allows the user to read lying in bed. Adjustable Pivot Resistance: Pivot resistance is adjustable, providing the user with the freedom to have movement without their reading material floating away as pages are turned. Height Range: Range of movement is between 30" and 56" (measured from floor to center of book platform). Tools Required: Small Crescent Wrench or Pliers, Small Phillips or Slot Screwdriver. Note: Assembly of base can be done by hand but does require a reasonable degree of grip strength. A small diameter flexible strap oil filter wrench would make this much easier. Set your LEVO G2 Book Holder to a height which eliminates a bent neck (either up or down). This will reduce the risk of tension developing in your neck while reading. Since you want to be as relaxed as possible while reading, a pillow or neck support which lets you rest your head can be of great benefit. This gives the muscles of the neck and shoulders a break and can actually have a refreshing effect. As these muscles are usually occupied with supporting the head, especially when the neck is bent, poor reading posture can put a constant heavy load on them. Ensure that your reading materials are at a height suited to your viewing capabilities. If you have progressive or multifocal lenses you will want to position them lower than users who do not require this type of corrective lens. However, when doing so always ensure that your neck is at a neutral alignment, directly above the shoulders. When using your LEVO G2 Book Holder ensure that you have sufficient lighting to properly illuminate your reading material. Positioning your lighting source from behind you and to the side will reduce the risk of glare. Choose a "colour" of light which is "warmer" or yellower. While "blue" light is closer to the natural spectrum and does provide excellent illumination many users find that it also creates eyestrain. In addition, if you are reading closer to bedtime the "blue" light has also been identified as having negative impacts on the production of melatonin, a hormone which induces sleep, and as a result can result in delays in falling asleep as well as lest restful sleep. New LED lighting is often in the "blue" range, so be careful when making your selection. USE your LEVO - While it may be more convenient at times to just pick up a book and read, remember that what often starts out as a short reading session can easily turn into hours. Once you start reading you will probably be preoccupied with the reading and won't think to place your reading material on the LEVO. As a result you would lose out on the benefits of your LEVO during that period.